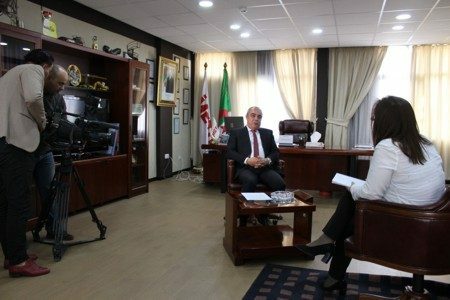 On Tuesday, April 10th, 2018, the Chief Executive Officer of IMETAL Group received a team from the Public Television Company (EPTV) in our premises and got an interview about the go-ahead of the State Shareholding Board (CPE) for the conclusion of a partnership between SIDER Group (a subsidiary of IMETAL Group) and the Emirati group “EMARAT DZAYER” under the 51/49% rule, for an investment of more than 160 billion DA. 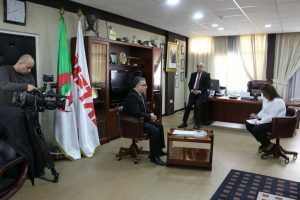 Mr Abdelhakim MAOUCHE spoke about the importance of this partnership for the Algerian economy and the financial health of IMETAL Group. The new joint venture will be named “Emarat Dzayer Steel (EDS)” and will be installed on part of EL HADJAR Steel Complex land, it will rehabilitate and give new breath to Seamless Pipe Plant (SPP), which will increase its production capacity from 30,000 to 300,000 tons / year. EDS will also be equipped with two new lines of the latest generation to manufacture new profiles: Merchant bars and beams. This project will create 1,600 new jobs in addition to the 400 workers at the SPP plant. 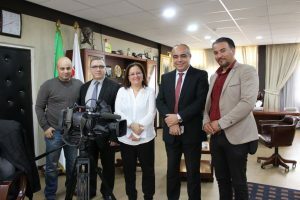 SGS Annaba presents at "SECURA North Africa 2018"